Geek Grotto - Get Your Geek On! : NIS America releases Umineko WHEN THEY CRY Volume 1 & 2! NIS America releases Umineko WHEN THEY CRY Volume 1 & 2! 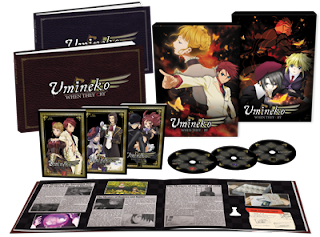 NIS America has just shipped Umineko WHEN THEY CRY Volume 1 & 2 in the US on Blu-Ray! NIS seems to be on a roll... Releasing special editions that rival what Working Designs did for games in the 90's! Read the full PR after the jump! The affluent Ushiromiya family patriarch, Kinzo, is on his deathbed, and his family has assembled at their private island to discuss the division of his estate. As they bicker over their father’s immense inheritance, a typhoon closes in, trapping them on the island. They suddenly receive an eerie word of warning...and then, in the dead of night, the murders begin. One by one, family members are discovered murdered in bizarre and inhuman ways. Some within the family turn to superstition, blaming it on a witch rumored to inhabit the island. But one of them—the young Battler Ushiromiya—refuses to accept the supernatural and vows to uncover the real killer behind the seemingly impossible slaughters. He soon finds himself confronted by the apparent witch, and enters into a life-or-death battle for the truth.